How to add an alias to a subdomain? For example, the subdomain name is sub.example.com and the alias name should be alias.sub.example.com. This functionality is not implemented in Plesk yet. Vote for this feature on the Plesk User Voice portal. Note: If you are a domain owner and Apache/nginx additional directives are hidden, please contact the server administrator or provider for assistance. Note: If the option Permanent SEO-safe 301 redirect from HTTP to HTTPS is enabled in Domains > sub.example.com > Hosting Settings, then, if alias.sub.example.com is accessed over HTTP, Web Server's Default Page will be shown. See the corresponding article for more information and resolution. Just make sure your alias subdomain resolves correctly to the same IP as your base subdomain you want to stick your alias to. Hello @Sage, thank you for sharing an alternative way to achieve this goal. Have you tried the steps from the article? Why was this way not suitable for you? Article offers redirect, redirect is not alias, it's just a redirect which sends browser to another location. Alias is fully-functional another name that points to same virtual host of webserver which is visible under it's own name, not under base subdomain name (they could belong to different domains at all). In my case, IP from DNS record became inaccessible (it pointed at old load balancer which IP became unavailable) and I created temporary address that users could use until their cached DNS completely change to point to new address. But not to bother with different DocumentRoot trees i just made it alias of another (temporary inaccessible for some users) subdomain. Yes, probably it's square-wheeled bicycle solution, but at least it works. The article has been updated according to your recommendations. Thanks for taking part in improving our knowledge base! This solution is really great. But how do I have to make Let's Encrypt also register the alias in the certificate? Can anybody pleaaaaase, explain this workaround better ...? I have added a screenshot of Apache additional directives screen. Hope this helps to apply the workaround. 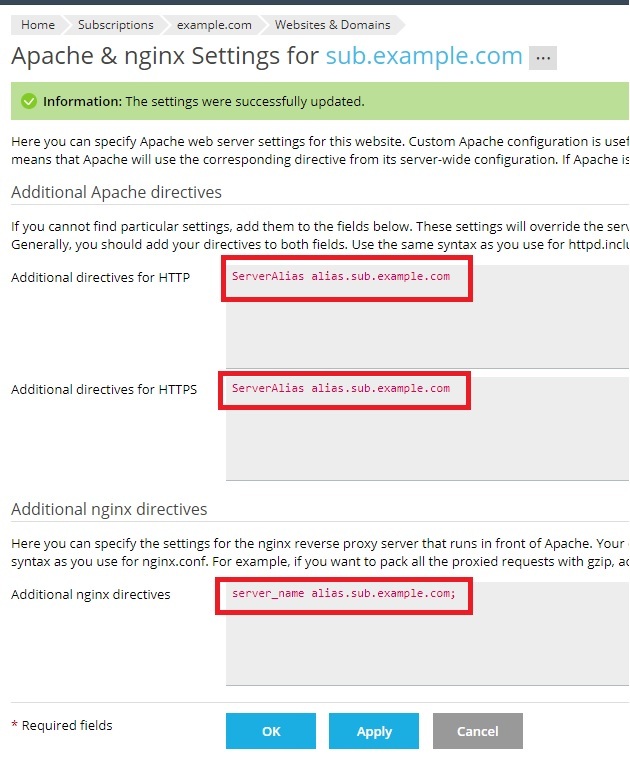 If you are a domain owner and Apache/nginx additional directives are hidden, it is needed to contact your service provider for assistance. Reply me if something else should be added to describe the workaround in a best way. If the web space is to redirect from HTTP to HTTPS (HTTP-301), the Apache rules for HTTP (port 80) are not included in the configuration using Include. This meanst it does not redirect a HTPP-Request to HTTPS. It shows the HTTP default page. Let's Encrypt does not work either, because Plesk does not know the alias subdomains in the interface. Very unsatisfactory that such a simple function is missing. @Ivan: Perhaps I miss something, but your tip does not work for me. Thank you for reporting this! The article was updated accordingly. The fact that additional HTTP directives are not used when the option Permanent SEO-safe 301 redirect from HTTP to HTTPS is enabled in Domains > sub.example.com > Hosting Settings is a known issue caused by the Plesk bug PPPM-9230. See the article https://support.plesk.com/hc/en-us/articles/360008854853 for more information on the issue.